Online hair styling software to try on different hairstyles and hair colours on a photo of yourself. Thousands of virtual makeovers possible! The possibilities are amazing. Used in many hair salons! This collection takes a single model and transforms her look, step by step, from a neck length bob to a gamine crop. The collection illustrates the drama and metamorphosis that lies in potential in every woman. Jennifer wanted a makeover without making a commitment to the new look. A long hair and make-up make-over. Curls straightened out and a shorter hairstyle for Brittany. Lorana was interested in having her hair straightened, and losing some of the length in order to make her hair styling routine easier. Long hair to bob makeovers for Intercoiffure Japan. Bob hairstyles that Japanese fashionistas love. A new hair color and a stacked bob for Summer Break. At any given time, a full fifty-percent of women are unhappy with the way they look. They say they want a change and many take the plunge to make that change – sometimes with disastrous results. Becca knew as a mommy-to-be that life was going to get really busy and she needed a hairstyle she was going to be able to manage easily and quickly. View the before and after pictures. A trendy men's haircut that offers balance and that prevents the face from appearing too wide. Videos of hair makeovers in progress, available to watch online. 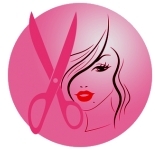 TheHairStyler has over 11,000 hairstyles to view and try on, including a large variety from the latest celebrity looks to salon styles from top salons around the world.